The central nervous system (CNS) is made up of the brain, a part of which is shown in Figure 16.19 and spinal cord and is covered with three layers of protective coverings called meninges (from the Greek word for membrane). The outermost layer is the dura mater (Latin for “hard mother”). As the Latin suggests, the primary function for this thick layer is to protect the brain and spinal cord. The dura mater also contains vein-like structures that carry blood from the brain back to the heart. The middle layer is the web-like arachnoid mater. The last layer is the pia mater (Latin for “soft mother”), which directly contacts and covers the brain and spinal cord like plastic wrap. 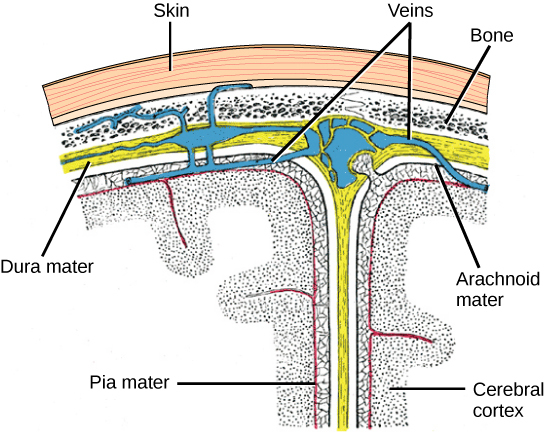 The space between the arachnoid and pia maters is filled with cerebrospinal fluid (CSF). CSF is produced by a tissue called choroid plexus in fluid-filled compartments in the CNS called ventricles. The brain floats in CSF, which acts as a cushion and shock absorber and makes the brain neutrally buoyant. CSF also functions to circulate chemical substances throughout the brain and into the spinal cord. The brain is the part of the central nervous system that is contained in the cranial cavity of the skull. It includes the cerebral cortex, limbic system, basal ganglia, thalamus, hypothalamus, and cerebellum. 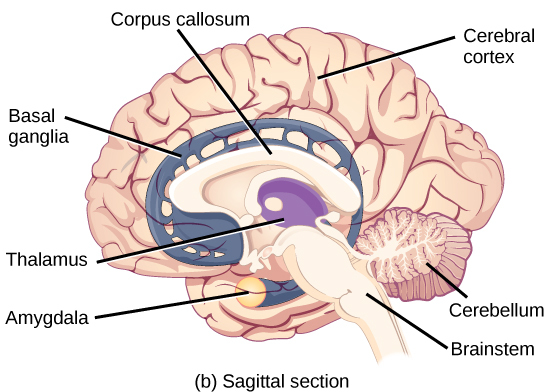 There are three different ways that a brain can be sectioned in order to view internal structures: a sagittal section cuts the brain left to right, as shown in Figure 16.21b, a coronal section cuts the brain front to back, as shown in Figure 16.20a, and a horizontal section cuts the brain top to bottom. Figure 16.20 These illustrations show the (a) coronal and (b) sagittal sections of the human brain. 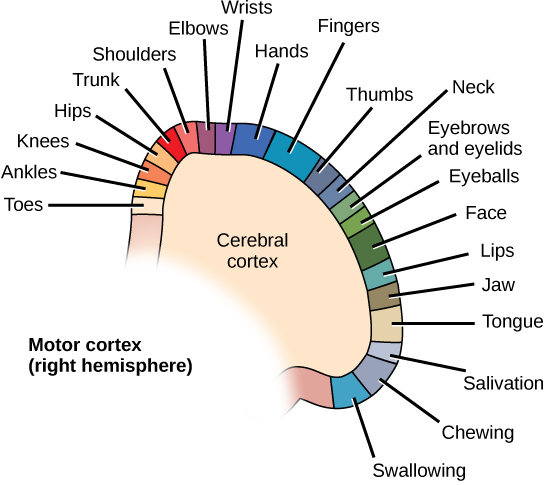 Each cortical hemisphere contains regions called lobes that are involved in different functions. Scientists use various techniques to determine what brain areas are involved in different functions: they examine patients who have had injuries or diseases that affect specific areas and see how those areas are related to functional deficits. They also conduct animal studies where they stimulate brain areas and see if there are any behavioral changes. They use a technique called transmagnetic stimulation (TMS) to temporarily deactivate specific parts of the cortex using strong magnets placed outside the head; and they use functional magnetic resonance imaging (fMRI) to look at changes in oxygenated blood flow in particular brain regions that correlate with specific behavioral tasks. These techniques, and others, have given great insight into the functions of different brain regions but have also showed that any given brain area can be involved in more than one behavior or process, and any given behavior or process generally involves neurons in multiple brain areas. That being said, each hemisphere of the mammalian cerebral cortex can be broken down into four functionally and spatially defined lobes: frontal, parietal, temporal, and occipital. Figure 16.21 illustrates these four lobes of the human cerebral cortex. Figure 16.21. The human cerebral cortex includes the frontal, parietal, temporal, and occipital lobes. 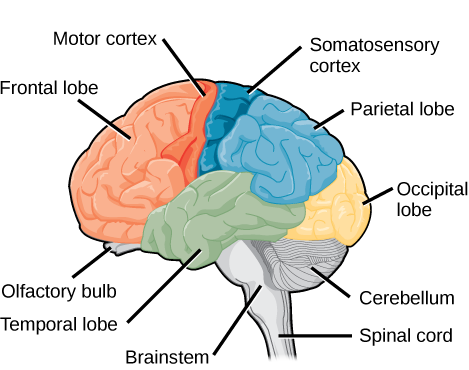 The frontal lobe is located at the front of the brain, over the eyes. This lobe contains the olfactory bulb, which processes smells. The frontal lobe also contains the motor cortex, which is important for planning and implementing movement. Areas within the motor cortex map to different muscle groups, and there is some organization to this map, as shown in Figure 16.22. For example, the neurons that control movement of the fingers are next to the neurons that control movement of the hand. Neurons in the frontal lobe also control cognitive functions like maintaining attention, speech, and decision-making. Studies of humans who have damaged their frontal lobes show that parts of this area are involved in personality, socialization, and assessing risk. Figure 16.22. Different parts of the motor cortex control different muscle groups. Muscle groups that are neighbors in the body are generally controlled by neighboring regions of the motor cortex as well. For example, the neurons that control finger movement are near the neurons that control hand movement. The temporal lobe is located at the base of the brain by your ears and is primarily involved in processing and interpreting sounds. It also contains the hippocampus (Greek for “seahorse”)—a structure that processes memory formation. The hippocampus is illustrated in Figure 16.24. The role of the hippocampus in memory was partially determined by studying one famous epileptic patient, HM, who had both sides of his hippocampus removed in an attempt to cure his epilepsy. His seizures went away, but he could no longer form new memories (although he could remember some facts from before his surgery and could learn new motor tasks). Figure 16.23. Mammals have larger brain-to-body ratios than other vertebrates. Within mammals, increased cortical folding and surface area is correlated with complex behavior. Interconnected brain areas called the basal ganglia (or basal nuclei), shown in Figure 16.20b, play important roles in movement control and posture. Damage to the basal ganglia, as in Parkinson’s disease, leads to motor impairments like a shuffling gait when walking. The basal ganglia also regulate motivation. For example, when a wasp sting led to bilateral basal ganglia damage in a 25-year-old businessman, he began to spend all his days in bed and showed no interest in anything or anybody. But when he was externally stimulated—as when someone asked to play a card game with him—he was able to function normally. Interestingly, he and other similar patients do not report feeling bored or frustrated by their state. The thalamus (Greek for “inner chamber”), illustrated in Figure 16.24, acts as a gateway to and from the cortex. It receives sensory and motor inputs from the body and also receives feedback from the cortex. This feedback mechanism can modulate conscious awareness of sensory and motor inputs depending on the attention and arousal state of the animal. The thalamus helps regulate consciousness, arousal, and sleep states. A rare genetic disorder called fatal familial insomnia causes the degeneration of thalamic neurons and glia. This disorder prevents affected patients from being able to sleep, among other symptoms, and is eventually fatal. Figure 16.24. The limbic system regulates emotion and other behaviors. It includes parts of the cerebral cortex located near the center of the brain, including the cingulate gyrus and the hippocampus as well as the thalamus, hypothalamus and amygdala. Below the thalamus is the hypothalamus, shown in Figure 16.24. The hypothalamus controls the endocrine system by sending signals to the pituitary gland, a pea-sized endocrine gland that releases several different hormones that affect other glands as well as other cells. This relationship means that the hypothalamus regulates important behaviors that are controlled by these hormones. The hypothalamus is the body’s thermostat—it makes sure key functions like food and water intake, energy expenditure, and body temperature are kept at appropriate levels. Neurons within the hypothalamus also regulate circadian rhythms, sometimes called sleep cycles. 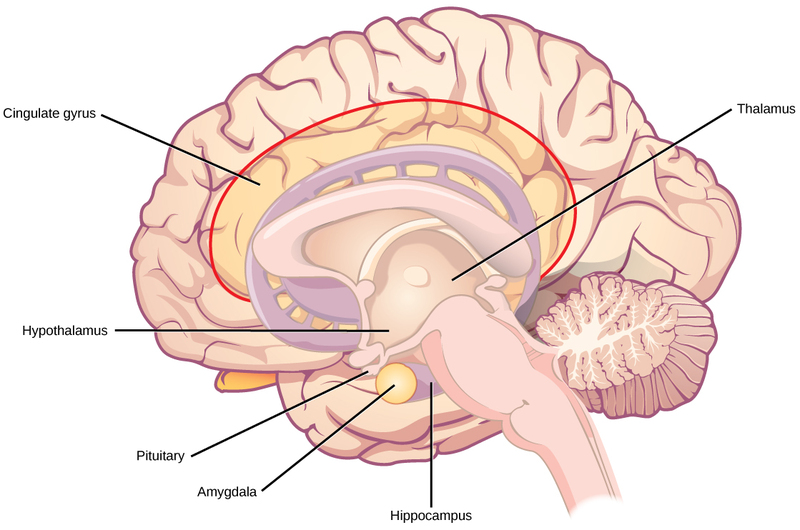 The limbic system is a connected set of structures that regulates emotion, as well as behaviors related to fear and motivation. It plays a role in memory formation and includes parts of the thalamus and hypothalamus as well as the hippocampus. One important structure within the limbic system is a temporal lobe structure called the amygdala (Greek for “almond”), illustrated in Figure 16.24. The two amygdala are important both for the sensation of fear and for recognizing fearful faces. The cingulate gyrus helps regulate emotions and pain. 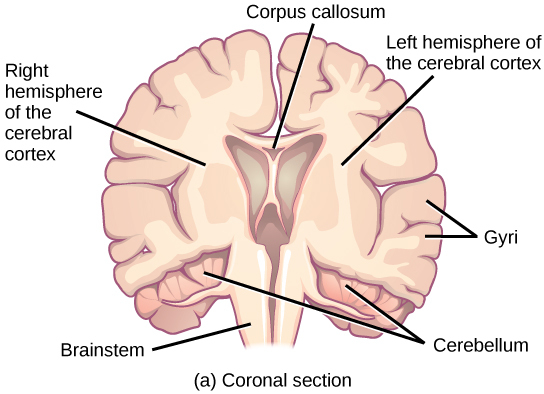 The cerebellum (Latin for “little brain”), shown in Figure 16.21, sits at the base of the brain on top of the brainstem. The cerebellum controls balance and aids in coordinating movement and learning new motor tasks. The brainstem, illustrated in Figure 16.21, connects the rest of the brain with the spinal cord. 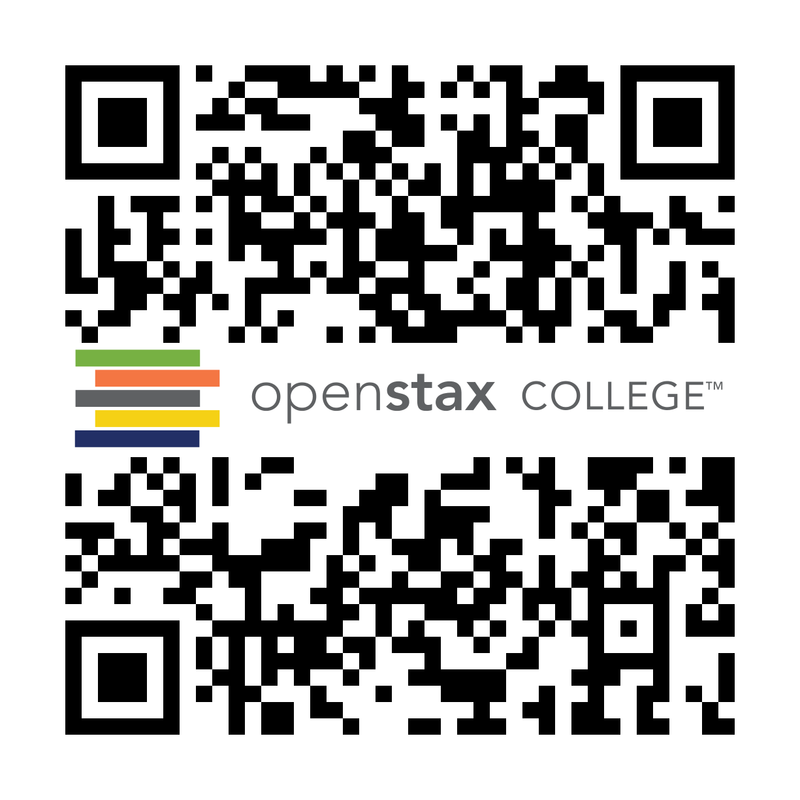 It consists of the midbrain, medulla oblongata, and the pons. Motor and sensory neurons extend through the brainstem allowing for the relay of signals between the brain and spinal cord. Ascending neural pathways cross in this section of the brain allowing the left hemisphere of the cerebrum to control the right side of the body and vice versa. The brainstem coordinates motor control signals sent from the brain to the body. The brainstem controls several important functions of the body including alertness, arousal, breathing, blood pressure, digestion, heart rate, swallowing, walking, and sensory and motor information integration. Connecting to the brainstem and extending down the body through the spinal column is the spinal cord, shown in Figure 16.21. The spinal cord is a thick bundle of nerve tissue that carries information about the body to the brain and from the brain to the body. The spinal cord is contained within the bones of the vertebrate column but is able to communicate signals to and from the body through its connections with spinal nerves (part of the peripheral nervous system). A cross-section of the spinal cord looks like a white oval containing a gray butterfly-shape, as illustrated in Figure 16.25. Myelinated axons make up the “white matter” and neuron and glial cell bodies make up the “gray matter.” Gray matter is also composed of interneurons, which connect two neurons each located in different parts of the body. Axons and cell bodies in the dorsal (facing the back of the animal) spinal cord convey mostly sensory information from the body to the brain. Axons and cell bodies in the ventral (facing the front of the animal) spinal cord primarily transmit signals controlling movement from the brain to the body. Figure 16.25. 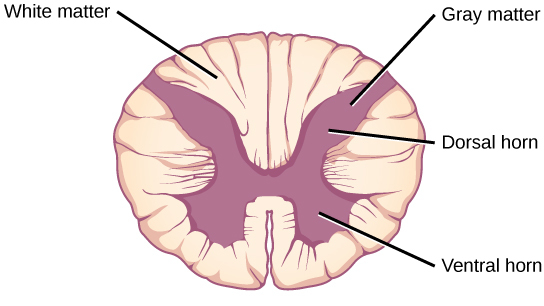 A cross-section of the spinal cord shows gray matter (containing cell bodies and interneurons) and white matter (containing axons). clear liquid that surrounds the brain and spinal cord and fills the ventricles and central canal; acts as a shock absorber and circulates material throughout the brain and spinal cord. 16.3 The Central Nervous System by Charles Molnar and Jane Gair is licensed under a Creative Commons Attribution 4.0 International License, except where otherwise noted.